From the opening musical number of How Now, Mrs Brown Cow, which opened this week at the Canon Theatre, I could tell this was going to be a different kind of comedy than I had been used to seeing on the stage recently. Where many comedic plays now are often a bit darker, How Now, Mrs. Brown Cow is pretty much like watching a sit-com on stage. How Now, Mrs. Brown Cow is the fifth installment in the “Mrs. Brown” trilogy (yes, you read that correctly) written by Brendan O’Carroll. It follows the life of Agnes Brown (Brendan O’Carroll), an Irish widow living in Dublin who is often visited by her dysfunctional family. The play takes place around Christmas, where she is eagerly awaiting the arrival of her favourite son Trevor who has been in America for four years. Unfortunately, Trevor isn’t coming and her children have to figure out who will break the news. The set-up is pretty much straight out of a sit-com, with enough numerous side plots and running gags to fill out the two hours. Even the transition music between scenes was reminiscent of many sit-coms I watched years ago. At points, I actually had to remind myself that I was in a theatre watching a play rather than watching a live taping in a studio audience. Brendan O’Carroll as the title character is worth the price of admission alone. The stage and plot provide the perfect playground for O’Carroll to improvise with. Any interaction between Mrs. Brown and her poorly treated father-in-law (Dermot O’Neill) was always entertaining and her one-liners were wonderfully sharp and cruel. My show partner Dan felt that sometimes a gag might run too long and that the rampant corpsing became a bit distracting after a while, but these moments were fairly rare and felt more a part of the experience than a mistake. Many of the greatest moments of the show came when O’Carroll would go off script, which was often. You could tell when this happened just by the reaction of his fellow cast who could barely contain themselves when it happened. One scene involving a character named Dino (Gary Hollywood) had Mrs. Brown unexpectedly slap him, leading to the most drawn out corpsing I’ve ever seen in my life. The one major downpoint though is that if you haven’t seen the other installments of the show, you probably won’t understand how the characters are related. The other characters feel underdeveloped and only seem to exist as a device for O’Carroll’s jokes and I feel like had I seen the other installments, I would have gotten to know them better. Luckily, the program provides character descriptions and with those I was able at least to understand the basic relationships. 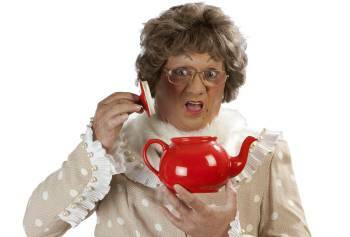 How Now Mrs. Brown Cow is a night of good old fashioned comedy that’s rarely found nowadays. It has the ridiculous gags and jokes as well as the sentimental heart only found on sit-coms and is great for anyone who enjoys that style of comedy. Brendan O’Carroll works such great comedic magic as Mrs. Brown that not even his fellow castmates could contain their laughter! That alone should give you an idea of how hard you’ll be laughing. i went to see the show Tuesday with friends, we all cried with laughter for the 2 hours. It is brilliant and ingenious. Loved it so much i am going back again next week with more friends and i am raving about it to everyone i know. I will be following behind Gillian with The Four Guys-,Twist-It. C – U – in – the – MEZZANINE on 21st.